We returned from Nashville this afternoon (thus the reason for no posts lately). I hadn't made it clear to yah'll here on the blawg (notice my newly enhanced southern drahwel?) that JT and I were puttin' a few miles under our feet here in the last few days. Specifically, we took on about 15 pounds of water apiece last Sunday whilst running 13.1 miles in the pouring rain in our own fair city. We both set new personal records for our half marathon pace, though I'd hoped for just a little better numbers on my part. 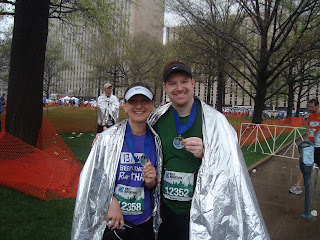 I knew six days later I'd have my chance to improve my time - since I'd be running another 13.1 miles on the streets of Nashville (one year after our first half, documented here). 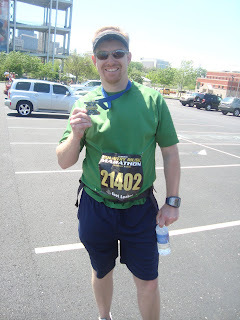 I had the distinct privilege of watching marathoners cross the finish line for my first time yesterday. Men and women who made a decision to do something few of us ever will do to and with our bodies. They set a goal and went about accomplishing that task. One. Step. At. A. Time. I saw broken spirits. Within sight of the resolution of their efforts. I saw triumph. I saw mothers and fathers lift their babies across the fence holding spectators back and proceed to carry those little miracles across the finish line with them. I saw a woman fall on the concrete at my feet from intense, excruciating cramps in her toes. Other marathoners stopped to aid her in pushing her feet forcefully toward her nose to counteract the cramping. I saw a man lift his two sons over the fence to accompany him to the finish. Before he could manage another step, he vomited. His young son patted Daddy on the back, took his hand and helped him up to finish his race. Another, aided by the cheers of the crowd, began running only to stop again, walking to the finish. Finishing as strong as he could summon. In the heat. Searing, burning heat. And, just as we were beginning to worry. Starting to fear that the heat had grown too strong, too much to bear. Just as the concern began to overcome us and force us to run along the sidelines to find him, to catch a glimpse of a green jersey. Right then, my mother-in-law and I saw him. We saw JT with a determined look. A strong stride. 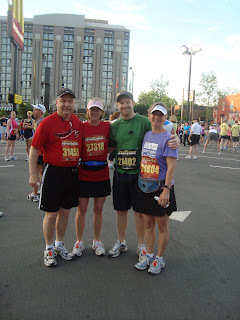 A man who had on that day become a marathon runner. Round the corner. Eye his family. Renew his strength. And cross the line. Tears ran down my face from relief. From happiness. From pride.